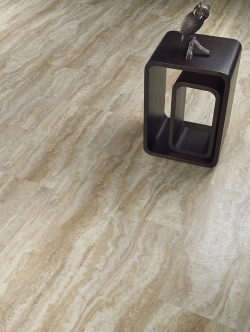 If you want flooring that has the realistic look and style of natural stone or wood while also offering exceptional durability and easy maintenance, luxury vinyl tile just may be for you. An increasingly popular flooring choice among today’s homeowners, luxury vinyl tile (also called LVT) uses 3D imaging technology to replicate the look and textures of high-end flooring such as ceramic tile, limestone, marble, slate, travertine, and hardwood – often with amazing realism. Many high-quality LVT manufacturers, including Congoleum, Mohawk, and Shaw, do such a good job at capturing the colors, textures, and grains of the natural stones and woods they replicate, some of their products are practically indistinguishable from the real thing. But while luxury vinyl tiles and planks may look like natural stones and woods, they can offer far more when it comes to durability. 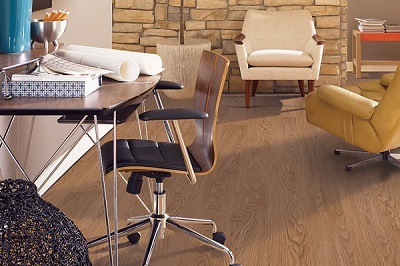 A specialized wear layer makes LVT exceptionally resistant to scratches, scuffs, indentations, and stains. And, unlike most natural surfaces, LVT won’t chip, warp, or yellow. Tiles are also naturally water resistant and won’t swell or buckle from moisture. This makes LVT a perfect option for rooms such as kitchens, bathrooms, laundry rooms, or basements – where humidity and high-moisture levels can often damage real stone or solid hardwoods. LVT is often less slippery than many natural surfaces, and some tiles include a slip-resistant layer for added safety. 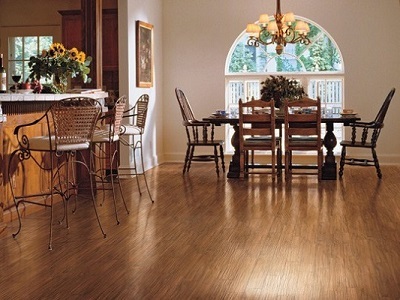 LVT is also much softer and warmer underfoot than ceramic tile or stone. These are just a few more advantages to using LVT in bathrooms – or any rooms where floors are walked on often by bare feet and paws (for those homes with pets). 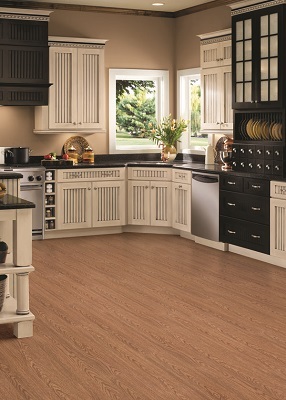 Luxury vinyl tile’s durability and dimensional stability mean it can take a beating – especially in high-traffic rooms. Many LVT manufacturers are so confident in the wear of their products that they back their floors with residential warranties of up to 20 years. In fact, Congoleum stands behind its Connections series with a 25-year residential warranty. LVT is typically thinner than hardwood planks, stone, or ceramic tiles, which makes it easy to install over most existing flooring – a great advantage for use in remodeling projects. Generally, padding or underlayment is not required, but it is important to install LVT over flat, dry surfaces so that no water seepage occurs beneath the flooring. Floors can be glued down or floated. And many products, such as the Accu Clic series from Earthwerks, include click-and-lock systems, which are even easier to install for do-it-yourselfers. Keep in mind that while installations can be relatively easy, some LVT manufacturers require professional installations to validate their warranties. Once floors are installed, it’s easy to keep them looking like new – just damp-mop regularly with water and a pH neutral cleaner. With LVT, there are plenty of design options. Tiles and planks range in styles from very formal to ultra modern. Most tiles include beveled edges and come in a variety of shapes and sizes. Wood planks can come in longer lengths, such as Shaw’s Sumter LS series, which offers 48” long planks for a more contemporary look. And tiles, such as Shaw’s Resort Tile collection, are available in very large 16" x 16" squares. Tiles can be laid with grout, for a more authentic stone or tile look, or without grout for a sleeker, seamless look. Wood looks feature the rich colors, finishes, and textures found in natural woods. For even more realism, collections such as the Hand Scraped series from Nafco by Tarkett can provide the rugged appearance of natural hand scraped wood. For more customization, many manufacturers also offer coordinating design strips and borders. You can even mix and match – a stone tile with a wood border, for example – to create a unique designer look. Design strips generally offer the same stain resistance as the tiles and won’t discolor like grout can. Is LVT the Right Choice for Your Home? Want to see just how well LVT captures the look of natural stones and woods? Stop in our showroom, or give us a call. We’d be happy to discuss the many LVT options available to help you decide if LVT is the right choice for your flooring needs.